Large ponds require a pond liner that is safe for fish and plant life, inexpensive, easy to install, and durable enough to last twenty years plus. 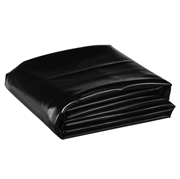 A Polyethylene pond liner is ideal for these applications, because they are extremely UV stable and are able to withstand temperatures from 180°F to -70°F. A Polyethylene liner from Pondliner.com is also backed by a 20-year warranty. Trust Pondliner to provide you with the high-quality pond liners and other durable pond supplies you need. The medium-density 20 mil polyethylene liner costs 25¢/ Sq. Ft. These prices are FOB Shawnee, OK and do not include shipping. The maximum size for a fabricated one-piece 20 Mil pond liner is 40,000 Sq. Ft.
We offer full installation services if your liner exceeds these limits.